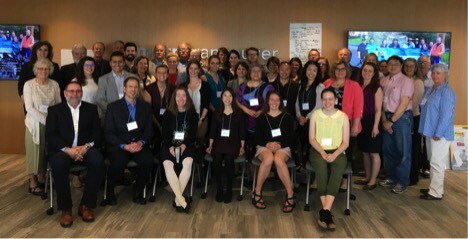 On May 7, I represented the Puget Sound Partnership at a collaborative workshop in British Columbia hosted by the Commission for Environmental Cooperation. The workshop brought together partners and officials from all levels of government to build community solutions to prevent land-based litter from entering the Salish Sea watershed. We’ve talked about the Partnership’s efforts to combat marine debris before. This workshop built on our past efforts by engaging with Canadian counterparts to identify low-cost, low-tech solutions. 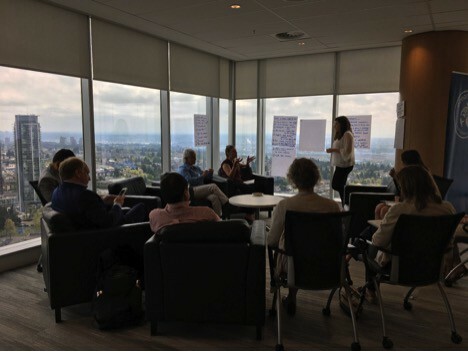 Participants from Canada, the United States, and Mexico gathered for a one-day workshop in Vancouver, British Columbia. Photo credit: Alannah Biega. Puget Sound is part of the larger Salish Sea ecosystem that we share with British Columbia. Just as water flows without regard to borders and boundaries, so too can ideas and best practices flow freely from one jurisdiction to another. This workshop drew representatives from Washington state agencies, the U.S. Environmental Protection Agency, Whatcom County, City of Vancouver, Environment and Climate Change Canada, University of British Columbia, and the Tsleil-Waututh Nation, among many others. The workshop also included a representative from the Mexican Ministry of Environment and Natural Resources. Learning from our neighbors and sharing our insights is an important part of the Partnership’s adaptive management approach, and is one way in which we continue to learn and improve our practices. The workshop opened with a plenary session, facilitated by Ocean Wise, in which participants identified major types of land-based litter that end up in our waterways. We learned that the cozy fleece sweaters we love can shed invisible plastic fibers when washed. Teabags that people may toss into the compost can contain tiny plastics that do not compost. Cigarette butts are among the most common item picked up during beach clean-ups and remain a widespread litter problem. After the plenary, participants broke into small groups to discuss five trash types: single-use items, cigarette butts, tires and artificial turf made from tires, stormwater runoff containing plastic fragments, and microplastics from textiles. Our goal was to identify solutions for reducing land-based sources of litter from entering the Salish Sea. Break-out session on single-use items. Photo credit: Jennifer Lee. I participated in the break-out session that discussed single-use items such as take-out containers, plastic utensils, and coffee cups. We shared many approaches from a range of jurisdictions. One participant described the Surfrider Foundation’s Ocean Friendly Restaurants program, which fosters restaurants to make sustainable choices for the ocean. Participating restaurants must follow proper recycling practices and use no Styrofoam. You may have seen the recent video showing removal of a plastic straw embedded in a sea turtle’s nostril. The program encourages restaurants to provide straws only upon request, instead of automatically placing a straw in each glass. By changing the default, the program reduces the number of straws used, while maintaining their availability for those who may need one, such as patrons with disabilities. Another low-cost, low-tech solution shared was British Columbia’s program of Return-It Streetscape Bins. The program provides recycling bins for beverage containers to municipalities for free, and places the bins in high traffic pedestrian areas where recycling options are otherwise limited. These bins can supplement community recycling programs and encourage recycling of beverage containers that would otherwise end up in the waste stream or our waterways. And in Portland, the Go Box is “doing away with throw away”TM by providing meals in reusable, returnable containers to replace single-use containers for take-out food. The solutions described here are just a few examples of the many approaches shared. The workshop raised far more areas of work than participants were able to address in one day, but it succeeded in inspiring a network of transboundary partners committed to preventing land-based litter from entering the Salish Sea. The Partnership’s work in this area will continue as we join partners later this month to finalize the Washington Marine Debris Action Plan.